Breakfast at the Honjin Onsen was very relaxed. Sitting by the big windows of the dining room with the shimmering light on the early morning ocean, was very beautiful. When we checked out, the front desk asked us if we wanted their driver to drive us down the hill to the beginning of the walking trail. In the blogs that I have read about people who have done this pilgrimage, many mentioned that they were picked up by their guesthouses or Ryokans, and were dropped back at the walking trail, the very next day. Some said that it was because they had no more “leg power” in them to walk at the end of the day, and others said that it was difficult to figure out where their accommodations were located. While in the Air Force, I learned to read maps and charts, which is a good skill to have. We have been able to find all of the places we stayed in, no matter how small and tucked away they were. Once we started walking with our Henro (pilgrim) white jackets and my big Henro hat, it took no time for me to feel like a pilgrim again, instead of a vacationer enjoying a luxury Onsen. When we made our way down the hill, and walked along the coast on our walking trail, an old lady was waiting for us by a street crossing. She held a ten yen coin in each hand and she handed a coin to each of us, saying that it was an Osettai (a gift made to pilgrims). We were SO touched by her kindness. We put her coins in a special pocket and we promised ourselves that when we reach Iwamotoji temple, we will deposit her coins in the main hall Hondo, and say a special prayer for her well-being. What a sweet and kind soul! When we left the coast, we started climbing up the mountains on a long and at times steeply inclined road. The old pilgrim’s route is closed for forest work until 2017, and so we had to walk along highway 56, the main north-to south artery of this area. For most of the way, we had a wide place to walk and the highway was not very busy, but the road climbed up and up, and there were no shaded spots to rest, no toilets, or vending machines to buy water or tea. The many mountains were connected with tall bridges and tunnels and I found myself walking fast, wishing to finish this part of the road. Jules adds: “Tali transformed herself into a speed demon today on this part of our walk. When we had a chance, we looked over the horizon to the mountains and the bridges that we had already crossed, and it seemed impossible that we had walked that far so fast…. The rest of the walk was more relaxed along rural farm roads and through small forests, and so I walked at a more leisurely pace.. It was a very hot and sunny day, and we stopped at a house that had a sign inviting pilgrims to come in and have some tea. The owners of the house run a hospitality garden in which they welcome pilgrims to rest, use their bathrooms and chat. They served me a green tea and for Jules they brewed fresh black tea in a press filter pot. They also gave us rice crackers and cookies. They asked us about our walking route and suggested some good options for the next week. They also made recommendations of places to stay and made some phone calls for us, to ask for availability and prices. They even made bookings for us! We were so inspired by their kindness, generosity and hospitality. They open their house every day until five in the afternoon, offering pilgrims drinks, toilets, snacks and good advice, for free; nobody pays them to do this. It is out of the goodness of their own hearts. It saddens me to think that so many people think the world is filled with dangers, and people who could pose a threat to them. In my reality, the world is filled with kind souls and even KINDER souls, who go out of their way to be helpful and generous towards others. We chose to take the longer route to Iwamotoji temple, because I wanted to buy ice cream. Jules joked that meantime, it seems that the “campaign” for consuming less ice cream and limiting sugar to once per week, is not going so well…. Luckily, I found an ice cream shop. All we had eaten that day for lunch was a slice of watermelon, some fresh loquats and a small bag of nuts, which we ate sitting under an improvised bench by a quiet farm. Fruit and nuts would have been a great lunch if we were at home, and not walking up and down mountains in the sun all day. Iwamotoji temple is a unique temple on the pilgrimage. 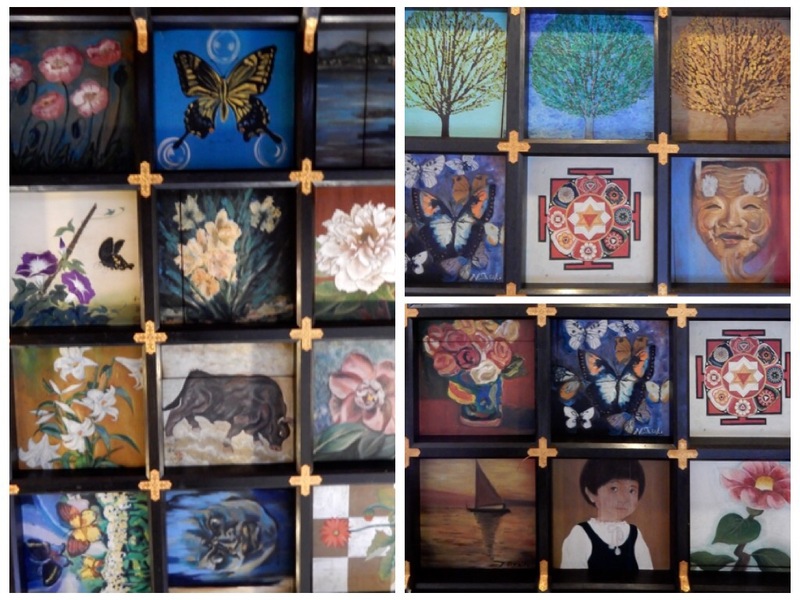 The Hondo (main hall) has a ceiling that is decorated with over 500 small paintings on wooden panels, all done by different artists. Many of the paintings are contemporary and have nothing to so with Buddhism. There is even a small portrait of Marilyn Monroe! They look wonderful and colorful mounted on the ceiling. We said our prayers, deposited the coins that we got from the old lady and prayed for her wellbeing and happiness. Then we checked into the temple lodging (Shukubo). We were given a very large 16 Tatami mat room that normally could have fit a group of people. The temple has a large Ofuru and I enjoyed scrubbing and soaking in the bath. Dinner was a communal affair. We dined around a long table with other pilgrims. Jules adds: “We always let our hosts know that we do not eat meat when we make our reservations, but we also add that fish is fine with us, out of respect for our hosts’ time and effort in preparing meals, since almost all meals in Japan include some fish. Here at the Iwamotoji Shukubo, we were served completely vegetarian meals, for the first time. There was a group of women Henros who were doing the pilgrimage by bus and were in awe that two Gaijins (foreigners) were walking the whole pilgrimage. There was also a man who was walking the whole pilgrimage counterclockwise. He had started at temple 88 and is walking backwards towards temple number 1. He asked us if he could ask a personal question. We answered that we are seeking enlightenment, but he did not understand this term in English. Jules tried to say that we are seeking to become more “light-filled,” loving and easy going, but he also did not understand the terms either. So I said that we are looking for “Satori,” which is a term for Enlightenment that the Japanese people understand. His eyes got bigger and his face looked like he was in awe. Most people walk for completely different reasons. Some walk because they lost a loved one, others because they seek healing or to clear up some sadness in their hearts. Some seek for better physical or athletic powers or to atone for wrong doing. Walking to achieve enlightenment seems like a BIG goal for most pilgrims. I find it amazing that so many Asian cultures have put the Buddha in the realms of the Gods, forgetting his teachings that the spiritual journey is about Self-Realization. Which means that one come to realize his or her TRUE SELF, beyond the dust of illusions. The Buddha taught that everyone can become enlightened in one lifetime, if they meditate and devote themselves to searching for Nirvana..
Like many Christians who believe Jesus to be the ONLY Son of God, while we stand below him somehow, the common people do not aspire to be like the Buddha and to achieve enlightenment and Nirvana. Still, I would rather speak the truth to everyone, even if they think that we are aiming too high. We are here to discover and bring forth the Buddha Nature within, or the Christ Light within that we believe exist in each and every one of us. But in all cases, no matter what the reasons for embarking on the pilgrimage, or what methods are used to complete it, it seems to do a lot of good to everyone who undertakes it. But it was very sweet, and was said in the spirit of someone who knows the hardships and the dangers of walking such long distances for many days. I wish to say something about our stats which I add at the bottom of each post. The active walking hours refer ONLY to the time we actually put one foot in front of the other. So when I say we walked 6 hours, it does not include stopping to take a photo, or to get tea from a vending machine, or to sit and rest, or when we stop and chat with people. The “Active Day” includes all of that, until we make it to our accommodation. A mountain hike that takes an active six hours, can be eight hours in the forests, because we do not measure the time we stop to catch our breath or have a drink, enjoy the views, etc. In preparation for the trip, we bought the Fitbit sports band but found it extremely inaccurate, so we returned it and bought the Satellite TomTom sport-watch which measures movement using an accelerometer, but backs it up with a satellite for accuracy. We compare it to the road signs we pass and it is very accurate. The plus of the TomTom sport-watch over the Apple-Watch, is that it’s battery does not need to be charged daily but can last three days if you do not use the music function to listen to music as you walk.